Mixing metaphors and casting cliches about hockey and the Maple Leafs for the ether's pleasure since MCMLXVII. For the second year in a row the Rangers scored on their first shot of the season. And for the first forty minutes of yesterday's game it appeared that that would be the only good news coming out of MSG on opening night. With the crowd still in a Leetch-induced frenzy (he dropped the ceremonial first puck), the Blueshirts came out on fire. 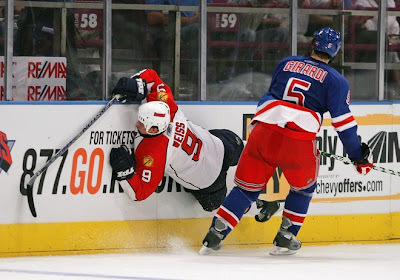 I had barely settled into my seat when Jagr took a breakout feed, passed to Drury, who in turn passed (deflected) to Rozsival --- BANG! 37 seconds into the season and it is 1-0 for home team. It looked like candy and sunshine for the ‘07-‘08 Rangers… Candy, sunshine, and Czech defensemen. Soon after though, the wheels came off. For the next half hour the Rangers looked like a bunch of flailing, wasted bar brawlers who couldn’t find the fight, much less get into it. They didn’t do anything right. And if it wasn’t for Henrik, they would have been beaten senseless by the Panthers on their own ice. Lundqvist kept them in it. He does that from time to time, I’ve heard. Then, sometime during the second intermission, Marek Malik stepped into a phone booth and came out wearing a Bobby Orr cape. Make no mistake, Malik, the whipping boy of many a Garden faithful (myself included), was the man that brought this team back. It was Malik’s crafty backhand pass that found Prucha all by himself on the left wing for the game-tying goal. Petr finished it, but that was Marek’s work and Marek’s pass that earned the tally. Mere minutes later, it was Malik again, this time firing a cannon from the left point, allowing Jagr to collect a rebound, and then Drury to find another before pocketing his first goal on Broadway. It also happened to be the game-winner. I’ve heard that Drury had a knack for those sorts of goals and it was nice to see. It was also just the spark the home crowd and home team needed. Floodgates: Open. Candy, sunshine, and Czech defensemen. - Vokoun looked rattled and rattle-able. Prucha’s goal got through him. Drury’s came on the second juicy rebound of the flurry. Callahan’s goal was nice, but should have been stopped. Straka got his on a shot that came off the back-boards. All of them were stoppable, none were. - The second Panther goal was deflected. Lundqvist was keyed on Horton’s shot, but it went off the player in front and sailed the other way over Hank’s right shoulder. I only mention this because Hank was unfortunate to get beat by a good number of deflection goals last year (many off his own teammates). I’m keeping track this year. - Jagr was held to two assists. He had a solid game, not nearly as quiet as some are saying this morning. - I love Dan Girardi, but only in a hockey-fan sorta way (I swear). See photo above for further details. - Marc Staal has played better hockey games. And I’m sure he will play better hockey games in the future. Despite a hiccup or two, I offer a big Raking Leafs’ Rangers Correspondent congratulations to the Thunder Bay kid for his first NHL game. Well done, #18. And yes, this is primarily a Leafs site. It's also a hockey site though, so the Ranger game recaps will fit in that category. The more hockey the better. Or just consider them my service to your fantasy team. Today's lesson: Vokoun owners beware. Oh, credit where it is due: Thanks the Sam at Rangers Report for the Jagr quote. My blog is worth $20,887.98.